On this page we have some facts, theories and common misconceptions about crop circles. Not all crop circles are created equal, but there’s still a lot of theories, and dismissal of the phenomenon in the greater society at large. We have tried to address some of the more common questions we receive during conferences or from the general public at large. A crop circle is any kind of flattened pattern in a field. The field can contain any type of plants: wheat, grass, rapeseed, rice, etc. The pattern can also be anything: a circle, a ring, a combination of shapes, a complex concoction, and even sometimes sloppy scrawls. Sometimes the geometry is perfect and breathtaking, sometimes it’s a mess.In a crop circle the crops lay flat on the ground. It appears like a stamp from above was pressed into its surface. The plants are not dead and they will just grow back and bend towards the sun again over time. 2. Are crop circles a new phenomenon? Terry Wilson discovered during his research for his book on crop circles there was an old paper on a ring in grass at Assen, formed in August of the year 1590 A.D. 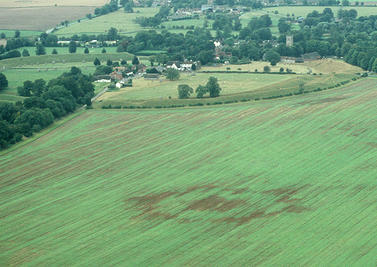 The article describes the formation of this ring according to eyewitnesses, claimed to be caused by dancing mythical, human-like creatures.The ring was actually plowed into the field rather than flattened crops: “The circle Remained from that day after … until the next winter, when the plowing of the field removed it” (From Robert Plot’s National History of Staffordshire, 1686). 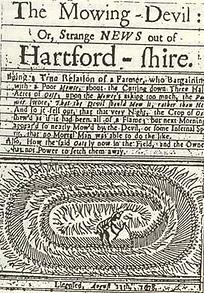 In 1678 yet another circle appeared in Hartford Wiltshire (England), with an article in a local newsprint following. It was written that “the grain was deposited in a way no man could have accomplished.” Again, this was feared to be the work of the devil, which was highlighted in an illustration of the Devil in a news story entitled “Mowing Devil” (seen to the right). In 1686 another several instances, which appeared in Robert Plot’s National History of Staffordshire, were identified, ranging from circles and half circles to squares, hexagons, squares surrounded by circles and circles with rings around the center formations. This was also quite a complicated formation apparently. Crop circles are nothing new historically. They may have even appeared in prehistoric times, but we lack record keeping about their formation. This is considered as a possible reason why our ancestors built their sanctuaries in circles (stone circles, etc.) It is true that since the late 1970s, have taken off in frequency. The phenomenon has now “exploded”, both in quantity and in quality. 3. Are Crop Circles Only Found In Grains? No, crop circles can appear in all kinds of crops: wheat, canola, mustard plants, flowers and grass, even rice, carrots, corn. There’s even been examples of them in snow and in forests where whole trees are laid flat. Trees being laid flat is a relatively common occurrence, considering the challenges of doing so. The name ‘Crop Circle’ is somewhat misleading, actually it is better to say ‘Crop Formation’. However, the more popular and well-known term is simply “Crop Circles”. 4. Where do Crop Circles Appear? Crop circles are common all over the world. In the Netherlands, Belgium, England, Germany, Italy, Poland, Denmark, Finland, Russia, Israel, Australia, America, India, Japan, Canada just to name a few. Nearly every agrarian area of the world has had crop circles at one time or another. 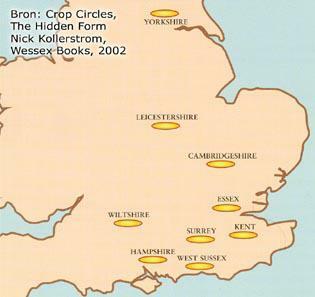 England, however, is “the birthplace” of Crop Circles. The place where most are seen and the ones with the most complex figures each year. Why certain places attract crop circles over and over again, we do not know for certain. One theory suggests it my be due to the presence of energy lines in and around the Earth (ley). Our ancestors were well aware of these energy channels and built their sanctuaries close to them frequently (dolmens, stone circles, pyramids, etc.). Maybe that’s why crop circles so often appear in South and Central England, where many strong ley lines frequently intersect (an exceptionally powerful example being Stonehenge in Wiltshire, the a high energy crop circle area as well). Also the East Field at Alton Barnes Wiltshire is a place of significant power, where every year at least one (and often even two or three) crop circles appear. Yet it is remarkable that in some places certain years get significantly more crop circle formations and then suddenly fall sharply in subsequent years. This can happen even on a national level. The Netherlands had in 1996 a record number of 99 formations, but one year later, in 1997, the number dropped to only 41. Why exactly this occurs remains a mystery. 5. For How Long Does a Typical Crop Circle Exist? They will usually survive until the end of the crop season, when the farmer harvests the field. Remnants of a crop circle can be found even in a harvested field. It’s true that the energy will still remain for years after the initial formation. The contours of the formation could still be traced well after the fact, for example, with the aid of dowsing rods. In some cases, the contours are visible in the new crops planted in the subsequent season. We call these ‘Ghosts’. (We will explain this phenomenon further under the Anomalies section in the drop down). 6. When do crop circles occur? When there are crops in the fields which are long enough to be laid flat this is the season for crop circles. This time period is typically from March to September each year, though it can be in different months. This is usually when crops such as corn or wheat are growing in fields, but crop circles also appear periodically in grass. There has also been examples of crop circles found in snow. The time of the day crop circles are formed is also fairly consistent. Most are formed in the time span of a single evening, even those of a tremendous complexity in structure. On July 7th 1996, the formation shown to the left appeared in broad daylight, near Stonehenge. It was dubbed ‘Juliaset’ at the time. Several eyewitnesses confirmed that they were sure it had developed the complex formation within the span of an afternoon. These eyewitnesses were pilots which had flown over Stonehenge that afternoon several times and noted at 6:30 pm there was no formation. However, when flying over only half an hour later, the complex formation appeared near Stonehedge. A traffic notice was issued with roughly 6 to 10 different reports of dangerous road behavior around the site, primarily from the A303 area. 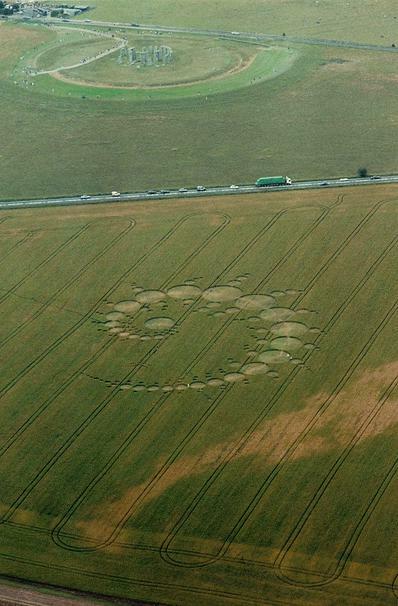 Motorists could see the crop circle that afternoon after it was formed and were causing a traffic jam due to pictures being taken. From these reports it can be certainly claimed that the large Juliaset formation, which contained 149 different circles appeared between 5:30pm and 5:50 pm that day. This was only a span of roughly 20 minutes!. So in broad daylight this formation appeared, in less than a half an hour. Enquiries showed that no one had seen anything, including the actual forming of the circle. These included the numerous tourists who visited Stonehenge and the guards who worked there. There are more cases of crop circles formed during the day, but thanks the case of the Juliaset being confirmed by multiple independent witnesses, this is was a unique example. 7. Crop Circles Are Man-Made? Most do not qualify as man-made. After the scientific study conducted by Dr. William Levengood of over 300 formations, he identified only around 6% which were labelled as “suspicious”. These did not show the same biophysical changes in the crops that were found among those of “genuine” origin. These formations encompassing the 6% were likely made by humans, known as “hoaxes”. There has been other research such as from the Dutch physicist Dr. Eltjo Haselhoff, which showed that some crop circles could also have been caused by human interference. These vary by the actual changes in the crop circle, and as a result it’s necessary for scientists to check on the formation after it’s discovered. It’s interesting to note that, although there is much evidence to the contrary, there are still many people who claim humans are responsible for all crop circles. They claim they’re responsible not only for the smaller, simple formations, but the huge complex ones that appear suddenly as well. This is a strange situation, as the science speaks from all angles on this topic. Over the years, Janet O. has talked to many people, sometimes informally as well, and there were some clear stand outs among those conversations. 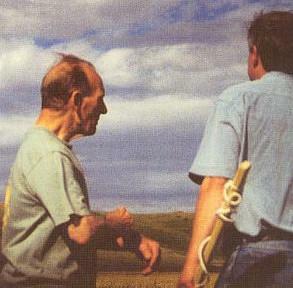 Firstly, Janet met with a man who made the claim he formed crop circles on a large scale: Doug Bower (found in the image on the right). 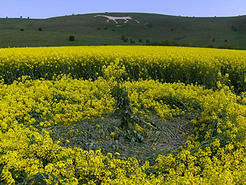 In 1991, he and Dave Chorley claimed they had made hundreds of crop circles on a British television program. They claimed to have only one objective: fooling people. They used a plank and ropes to flatten grain. The result was a sloppy circle, which didn’t appear anything like the beautiful formations that had captured the media for decades prior. the journalists during the interview unfortunately did not confront them about this fact, but instead assumed what they said was the truth. If you asked them how this was possible, with scientific evidence, they never came up with an answer. It was so strange these men would claim they spent night after night out in fields, but their wives reported nothing of the sort. While one would claim responsibility for a formation, the other would deny it. As the story of Doug and Dave was cited and explored by journalists all over, it just became more credible in the eyes of skeptics, and still to this day shapes the dialogue about crop circles. After Doug and Dave’s team appeared, three other men from London also came out and claimed to be artists of these fields as well. Janet dubbed them “Team Satan” due to what she viewed as the unsubstantiated lies they continually marketed to the public. They called themselves the “Circle Makers”, a term that genuine crop circle enthusiasts have since co-opted from these frauds. Janet interviewed “Team Satan” as part of the video documentary she created called Crop Circles, The Research, in which their leader John Lundberg claimed they would not reveal the precise formations they claimed to have created. They said this would “harm the magic of the phenomenon”. They claimed to work out their planned formations on paper prior to going to the field, but they would only do them at night. This was truly a remarkable story, because it means they were also there and interacting with the real Circle Makers. Asking what formations these were resulted in no disclosures. Janet actually attempted to coax the information from them, offering to keep it a secret to help preserve the “magic”. They were quiet, and simply smiled at the request. 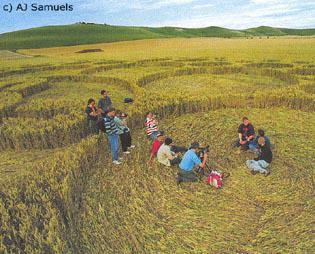 Due to the popularity of the shows, and documentaries on crop circles, Team Satan was hired to do a car in a field out of grain for a Mitsubishi commercial. The three went to work on the field, in broad day light no less. This led to a very educational experience for researchers of real crop circle phenomenon. They first put sticks into the ground to mark certain areas of the formation. This is not found in genuine formations, and was also very noisy experience to witness even from a distance. Both of these were much different than typical crop circles of authentic origin, where people cite no noise at all. and sudden appearance. Teamwork was also a major problem, and proved to be a source of much disagreement. Even under ideal circumstances, it took the three over 14 hours to complete the formation, and was not of particular high quality (see the image to the right). This is far too long, and far far longer than much more complex formations appearing. Many have been independently verified to appear in a matter of one hour, or less. After watching this spectacle it was clear, these men were not responsible for these complex and unique formations, many of which far larger than this car, and far more symmetric and beautiful. One other thing that was noticed when observing their work, these men were professionals in their organization. Their communication was top notch and very articulate in their instructions. Artists are rarely of this nature in teams, most are very focused on their individual creations and lack the experience to work in groups. Team Satan is just slick on all fronts. It definitely seems like these men were well trained, possibly by governments, to spread disinformation. This sort of disinformation has worked very effectively with regards to crop circles. Just like with the claims made by Doug and Dave, many people still have their opinion shaped by this original documentary, and its dubious conclusions. Public opinion is quickly formed, and when people hear “crop circle researcher” they associate these formations with two men from England, or two young dutch boys who both were clearly faking their experiences. Is there anything more threatening than the idea they are not made by us?